Current Richards family photo. Back row, left to right: JJ, Tammy, Caleb, Brandon. Front row: Gideon, Iris, Hope, and Faith. 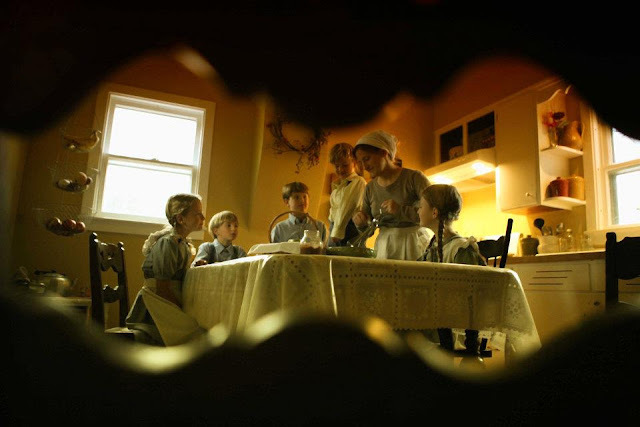 Did you have many friends among the Amish? Rebekah: I found that most all the ladies were friendly. A couple in particular I really felt like were friends. One was Freida. Another was Annie. I remember driving by her place and recognizing it from my childhood, getting out and saying, "Do you know me?!" Tammy: I had a couple Amish I considered friends, and I still exchange letters with them. Erin: Oh yes! So close that to me we feel as if we are one of their family members. I just went to an Amish funeral for the woman that was like my Amish mother. The men don't hug women, but her husband hugged me five minutes, bawling his eyes out. Every time I return I feel tempted to live like the Amish again– my husband calls it Amish-meningitis. But he doesn't want to return—he likes me looking pretty, curling and highlighting my hair and dressing classy. Alexa: We had a few. Our landlord’s family, the family we bought chicken feed from, the family that we bought milk from, an older lady who hired me to help at her greenhouse for the summer, and an older couple that we helped with all sorts of things and they helped us with some stuff too. Jerushah: They were all friendly kids and their parents, too. But one of the leaders was afraid that we were too much like them and we might convert their kids. In some ways we were stricter than they were. They always talked to us, but it didn't seem like I had any real friends. Josiah: I don't think so. Bekah Jo: There were a few girls my age who I'd play with and we'd write letters, but we didn't see them often. Jonny: Yes, I had many friends. The Miller boys especially were my friends. 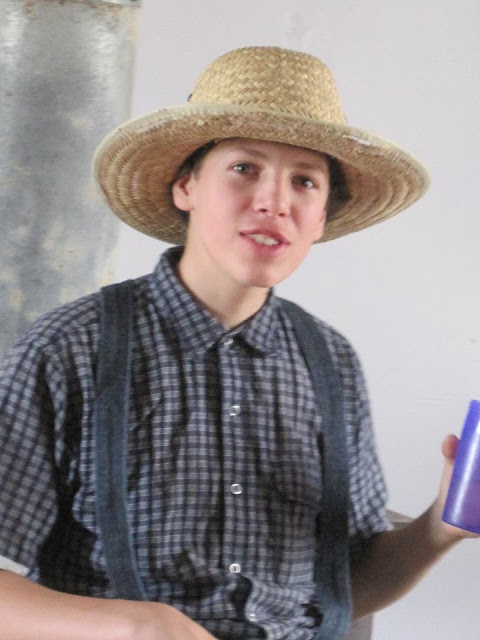 Jesse: I had one or two friends that were Amish. Joash: I don't think so. Keturah: I considered every girl my age my friend, and we got along very well. Though there were some I liked better than others. I had the most in common with Alexa though, as we could talk freely about our interests and for awhile, she and I would work together for an Amish lady that owned a greenhouse. Alexa and I on Alexa's wedding day. 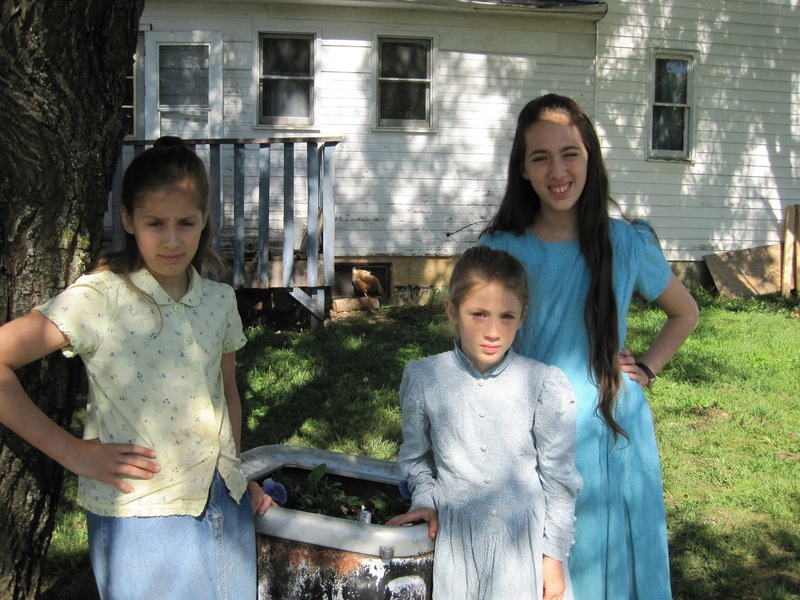 What was the best thing about living among the Amish? Rebekah: The best things were when my husband was home. Cooking a meal. Eating at the table. He could keep everything running so smoothly. Life changed from hard to easy. The vehicle would run. The pump would work. Tammy: The best thing about living that lifestyle was the physical labor required. And the freedom from electronics. Alexa: The slower pace was nice, and not having all the electronics. Jerushah: I like the produce. My two brothers and I could saddle or hitch the horses or pony to the carts or buck board and go almost anywhere we wanted. We picked up stuff, produce, milk, or hay. Sometimes we picked up soda cans all day alongside the road to make money. Bekah Jo: The best thing about living with the Amish was that we lived away from the road so it was easier to have animals and there was lots of fun stuff to do on our piece of property. Also, because we didn't have electricity and running water we had to learn new ways to get what we needed. We started fires for heat and hauled buckets of water from the neighbors. I thought it was a lot of fun. Jonny: My favorite thing was learning to use and work with horses. Jesse: The best thing about living there was that it was in the middle of the country. Keturah: I loved all the space. I loved having goats. I loved having shelves for my books. I loved being surrounded by people I liked. I got along (surfacely) well with everyone and that made me happy. I loved learning so much about the Amish and reading all their books and I began to learn Pennsylvania Dutch and High German (the latter which I'm still learning). Keturah Lamb, age thirteen or fourteen. Rebekah: The worst thing was burying our baby. 'English' people had warned me that I was working too hard. At about six months pregnant I became so exhausted I could not keep up. I quit farmer's market and baking. And then realized he wasn't moving. Our tenth child is buried in the Amish cemetery. I also regret that my children had to pick up so much slack in the days following and then through my next pregnancy. Tammy: The worst thing was the heat. We had the cook stove for baking and during summer the house got really hot. Especially the day my daughter had the stove well over 500 degrees and it was 100 degrees outside. Also having always had a refrigerator, adjusting to using a freezer with ice in it to keep things cold took some effort. A lot of food was wasted because things don't keep as well that way. Erin: That everyone knows your business, and there can be a lot of drama. And people might talk bad about you, or you might talk about them. It's inevitable that you get annoyed when you live close to people — I never got annoyed, I loved everyone. But people did with me. And people had pulled away from us. Jerushah: When your water pump breaks and you have to haul water from the neighbors. Bekah Jo: The worst thing was sometimes we didn't have a way to fix something. Our car would break down. Our generator would stop working, and it'd take a lot of work to try to fix everything, haul all that water, and keep the house warm. Jonny: The worst thing was that we weren't Amish. Jesse: The Amish were like a big club. If you weren't part of them they wouldn't let you do very much with them. Keturah: The worst thing was feeling like I couldn't have any real conversations with the girls my age and knowing that their religion was rooted in hypocrisy, according to my studies. I remember attending school and Rebecca reading devotions to us from a bible story book, which I thought horrid as it tried to water down the stories for kids. I often rose my hand in school and corrected the stories. One such time she told the story of Samson and his "wife" Delilah. I raised my hand, "Delilah wasn't his wife, but a concubine." She didn't seem too happy. I remember at times it felt so dark there. Eventually that feeling grew so heavy I wanted to leave so badly. Also, our Dad was away a lot roofing in Montana, 2500 miles away. 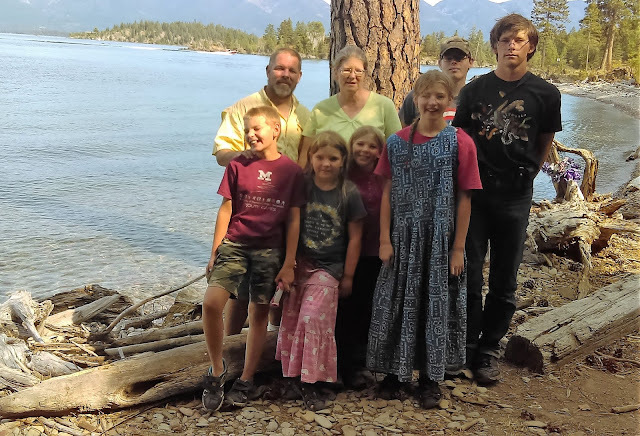 Often times he'd be gone for months at a time and everything would break — our vehicles would quit running, our water pump wouldn't work, and our pipes would freeze. The Amish would sometimes help us, but not always. And sometimes it would take weeks even though they knew. Our Amish landlord rarely helped, but only added stress to our lives, raising our rent during one of our hardest times. 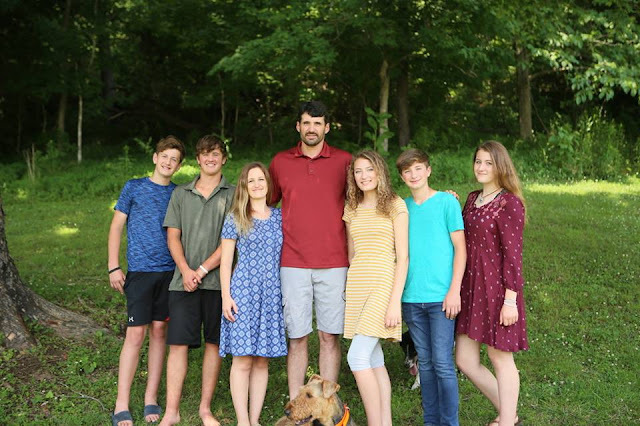 Left to right, Mark jr, Miles, Erin, Mark, Megan, Michael, and Molly. What was something that you learned from your experience? Rebekah: My faith in God was severely tested. I can't do life on my own. Tammy: I learned a lot from our time there. I learned I don't mind doing laundry by hand. I learned it is not too bad having no electricity. I learned that I do enjoy hard work and being tired at the end of the day is nice. I learned the quiet of a non-electric house is a blessing! I learned to use the cook stove and made sure that our house now has one that I use all winter. I found new ways to do things that seemed easy in everyday living with electricity. I learned that the lifestyle would be much easier with a husband at home and not gone to work every day. Erin: Millions of things. But the most profound thing I learned was how to exist in independently in a community setting; how to be self-sufficient while learning to work together. Alexa: Gardening, canning, using a wood stove, and different ways of doing laundry, keeping things cool, and getting used to hard work. Jerushah: I learned how to work with a horse, use a wringer washer, and start a fire and keep it going. Josiah: How to climb a tree. Bekah Jo: One thing I learned was that we have so much and we never even realize it. We have water, heat, light, air conditioning, a stove, shower, bathroom that works well instead of using an outhouse, and a lot more. Jonny: I learned some garden tricks, a lot about horses, and a tiny, tiny bit of Dutch. Jesse: That I don't believe something just because of tradition. Never romanticize anyone or anything. You will be sure to be disappointed if you do. A ton of Anabaptist history. Household skills and skills of how to survive without modern conveniences. Would you ever go back to that sort of lifestyle? Rebekah: I would never choose it under the same circumstances . . . yet the simplicity and family togetherness are still things I desire. Tammy: I would definitely go back to the lifestyle. But also using the things I learned. I would want my husband to be at home working, not away. I still do many of the things I did there, though we have electricity and use our air conditioning in the summer. I still line-dry clothes in all but winter, garden, dry and can things, do all dishes by hand and use the cook stove for cooking in cold weather seasons. Erin: I would in a heartbeat if I could, but my husband doesn't want to so I can't. But I have the most amazing community with the Campbells. I feel I have the best of both worlds right now. God has given me community when I didn't think I could find it among “English” people. If I could, I would give up all technology. I hate cell phones. Even adults get sucked into phones. I can't stand conversing with someone and their stupid phone blaring with notifications. I keep my notifications off. Phones distract you from doing what the Lord has for you in the moment. I told my husband I want my farm back. Days are too idle, we still have a milk cow, but not enough chores. Homesteading brings the family together. Alexa: Probably not, maybe a simpler lifestyle, but I’m rather fond of some modern conveniences. Jerushah: Yes, I loved it. But I would change some things. Bekah Jo: Yes, I would go back to that sort of lifestyle. Jonny: Honestly, it would be very easy for me to go back, or at least I wouldn't mind it. But I don't think I could become Amish to do that. But to live simpler would be awesome! Joash: Yes and no. I would if there was electric. Keturah: Yes, as long as the Amish weren't a part of the environment. I'd like to live in a self-reliant setting without the drama and stress of a burdening denomination. I'd want real friends around me. Would you recommend this experience to anyone else? Why or why not? Rebekah: Hmmm . . . It depends on you. Tammy: I would not recommend the lifestyle to just anyone. Most people who live off grid have solar or generator to give them power in order to have the modern conveniences. I guess we could have done something like that and been even more comfortable. It is not an easy life, though I think growing up in it would make it so much easier. My background was nothing even close to living that way, so it was, at times, a struggle. Erin: NO! Because it's usually not going to work out. It's nice to learn the skills, but you can learn them from YouTube. I wouldn't recommend people living among the Amish because they are going to be disappointed, and have their heart torn out. Sure, you'll learn a lot, but you won't be able to stay. You won't be accepted. You could join a new order Amish or Mennonites that drive vehicles. But it wouldn't be the same. You can try to join the Amish community, but it's really tough. You can do everything perfectly but they still most likely won't let you join. We considered it off and on while we lived with them. They would have had to put us on probation for five years. And after those years we'd be under their scrutiny for a long time. It just wasn't worth it. Alexa: If they do their research first. It’s hard, but it is a bit easier if you know a little bit about how to do it. Jerushah: Yes, I would. Even if you don't end up liking it you really appreciate a house with electricity. And it teaches you how to do stuff differently. Also when you go without movies and video games you find out how much time you have. Josiah: It depends if they want to live without electricity. Bekah Jo: Yes, I would recommend this experience to other people because it teaches people how to live on hardly anything instead of depending on things that can stop working. Jonny: I would definitely recommend it. I personally think it is good to do without a lot of our conveniences, not necessarily all the time, but more of the time. Especially things such as movies and social media, which you really can't have when you don't have electricity. Jesse: Yes, I would to all the people who have never shot a gun and who have never worked in a field and to all of the city slickers. Keturah: Absolutely, but not necessarily with the Amish, though that would be a good eye-opener for many. I believe everyone should have some sort of experience like this because it shapes you in many good ways. It toughens you up to reality giving you life skills all at once. I think it would be good for a lot of my younger siblings to relive the experience as many of them were babies when we left. As I've put these interviews together so many memories have surfaced, good and bad. Many of my siblings' short sentences resulted in HUGE stories I wish there was space to elaborate on. Living with the Amish wasn't glamorous. But neither was it a total nightmare. It was one of the hardest times of our lives, but possibly one of the best? Of course I can say the same thing about many other experiences. But this one was truly unique. Above all, what have you learned from these interviews, if anything? This has been pretty cool!!! I do think the Amish lifestyle is so neat and interesting (though I certainly don’t agree with their theology). I love hearing your little stories about your experiences! I actually bought a horse from the Amish, a few years ago. I joke that they sold him because they weren’t getting to church on time (he’s a very laid-back and slow horse). But he was my first driving horse, and it’s been a fun experience getting to do that with him. this is quite interesting.. Though when I plant my flag and banner on new soil, I wonder how I might be an emissary of sorts to my possible Amish neighbors. Just like you would be to any person — be an example, display the fruit of the Spirit in every aspect of your life, and love them. Build relationships and show God in your life. They will ask questions, and be prepared to answer them :) Thank you for commenting!